Why Should You Have Realtor Representation When You Buy New Construction? 1 - We pay for a home inspection for you - The builders hire superintendents for each of their neighborhoods and therefore, the result is only as good as the superintendent. There are minimum construction standards that the builders are held accountable to and usually nothing more. Sloppy construction can be a frustrating issue. Having a qualified third party come in to inspect the house right before the 1 year warranty is over is crucial. At this point, the house has settled and the inspector can get into the attic, look at the roof, check the insulation, etc. to ensure that you have a quality-built house moving forward. 2 - It’s important that you know the maximum amount you should pay for the house. Not much is free with the builders normally. The visit to the design center can be an expensive one if you decide to upgrade the standard features and if you decide to add on some extras. Your end result could put you in a negative equity situation at closing. It’s important that you view a comparable market analysis before so you can determine a budget to spend at the design center. 3 - The new home builder purchase contract is lengthy and much of the time, buyers do not really know what they are signing. We will be there with you at the contract writing appointment to discuss any questions or concerns you may have. 4 - We can help you with financing options. Again, the builders expect you to use their affiliated lenders. We can look at the lender fees and loan options with you to make sure you are being charged fairly and that you chose the best loan program. 5 - Lot location and resale features - It is crucial that you make the right lot choice for overall investment purposes. The lot location and exposure is critical for resale value. We can offer suggestions for the best location within the subdivision. Having a professional at your side during the selection process for the interior features is also highly recommended. You may pay too much for a feature that has no value in the future or miss an important upgrade that is necessary for resale. Buyers must know the ins and outs of the process before they make the decision to build a new house. We are happy to provide a free consultation and there is no charge to you to have us represent you. The builder pays all real estate fees. *We have to be with you the first time you visit their office so please call us and we will make arrangements to accommodate your schedule. 623-536-1111 or text: 623-341-5685 or 623-298-8916. Don't Find Yourself Outside the Cage! Don’t Find Yourself Outside the Cage! Use the experience of Baxter Home Sales and Keller Williams Professional Partners to protect your from the “open waters”! Why is buying and selling real estate so scary? Because there are over 40,000 realtors and even more lenders, many of whom do an average of 1-5 transactions per year. are brand new to the business, or simply do not run a full time business. To operate at a higher level of real estate is not easy and only a few realtors take the time and energy to truly operate at the elite level. What kinds of questions do you ask when hiring a realtor? 2. How many transactions do you do each year? 3. Do you have a personal website? 4. Do you work for a reputable company? 5. How many listings have you sold in the area recently? 6. What did you do before you became a realtor? 7. Where is your office located? 8. How quickly would you be able to show my house? 9. How will my property be advertised? 10. Am I committed to a contract with you if I change my mind? 11. Will you discount the real estate fees if I buy another property through you? 12. How often will I hear from you once the house is on the market? 1. Marta has been the business for 14 years and has managed an average of 80 transactions per year for 11 of those years. John has been in the business for 9 years and has managed an average of 80 transactions per year for 9 years! 2. We average 75-85 transactions per year. 3. Yes we have 3! www.baxterhomesales.com and 2 individual websites through Keller Williams. 4 . Yes! We work for Keller Williams Professional Partners. Keller Williams agents lead the industry in experience, education and results and the #2 training company in all industries in the United States. Keller Williams is also the largest real estate company in North America and doubled in size during the recession. Keller Williams brokerages appeared in the Top 50 Agents more than any other Brokerage, making Keller Williams number 1 in sales volume per office, highest increase in sales volume, closed transactions per office and largest percentage increase in closed transactions according to Fortune 500. 5. We have anywhere from 5-20 listings in the Goodyear/Litchfield Park/Buckeye area at any given time. 6. Marta worked for Hi Health for 7 years and held the following positions: Director of Operations, Corporate Sales Trainer, District Manager and Store Manager. John worked for Florida’s Natural Growers as a Senior Systems Analyst for 10 years. 7. Our office is located at 2403 N. Pebblecreek Parkway in Goodyear. We are in the center of Palm Valley. 8. Due to our Palm Valley office location, we can show your home in a moment’s notice. 10. We have a “no obligation guarantee” so if you change your mind, we can have you off the market in a matter of minutes with no additional cost or fees. 11. Yes! We will discount the real estate fees if you purchase another home through us, recommend another client to us during the listing period, or if we sell the house ourselves. Once we have closed a transaction through you, you will never pay full real estate fees as a thank you for your continued business. 12. We will call you at least once a week to discuss the market, before every showing and after most showings with realtor feedback. in addition, you will be set up on a portal that will continually keep you abreast of any market changes. The title of this article would suggest that we are offering poor advice, but in reality what we want to do is illuminate some of the pitfalls of selling a home and a few things you can do to enhance the value of your home. Now that homes values are on the rise, many people are thinking about selling their homes in the near future. We get quite a few questions from sellers asking what types of improvements they should make in order to bring more value to their home and what items they should skip. We thought we would put together a list of do’s and don’t to better coach future sellers so that they may get the most for their homes when it is time to sell. These pointers only apply to people who are looking to gain an extra $5000-$10,000 or more for their homes. For sellers who are offering a discount due to the house being classified as a “fix-up”, then these rules do not apply. Simple corrections guarantee a higher net for the seller. Power wash the driveway to remove any stains; clean the front door and ceilings to remove the dirt, dust and cobwebs; remove excess yard clutter; bring in more rock; clean and trim the landscaping, replace decrepit door hardware and repaint exterior and front door if necessary. · Bad Smell – cigarette smoke, pet smell, strong smell from last night’s dinner, etc. Rule #2: Remove all excess clutter from the entire house. Rule #3: Thoroughly clean all baseboards and walls. Rule #5: Ensure that the house smells fresh. like no pets live there. Simple corrections: If you cannot completely remove the pets, then completely remove the items that show a pet lives in the home like dirty dog dishes, bones, litter boxes, pet droppings in the yard. Secondly, barking dogs or pets wandering around the house during showings will decrease the value by causing a buyer to be “turned off”. Restrain from cooking foods with heavy spice during the listing period. Burning strong scented candles is also a problem as certain people are allergic to candles and t certain scents may turn them off. If you know you are going to move for sure, move all unnecessary items to the garage. Excessive clutter distracts the buyers and makes the rooms appear smaller. Remove excess pictures from the wall, particularly family photos and patch and repaint the holes. Remove extra or extra- large pieces of furniture that crowd a room. Ensure that the main selling points of the house are maximized and displayed properly. For example, if a home has a gas fireplace, the seller needs to make sure that the fireplace is not blocked by large furniture pieces or crowded by other pictures or wall decorations. Rule #7: Do-it-yourself jobs may save money initially, but end up costing more in the end when future buyers see an unprofessional job that needs to be redone. We recommend that all improvements be done by a qualified professional. Again a seller should not create another reason for the buyer to second-guess the home. Unfinished projects are definitely a deterrent as well. In Arizona people spend quite a bit of time in the backyard during the fall and spring months. Having a great backyard is very important. Even if the backyard is simple (a little grass in some curbing), rock around the edges, a couple of trees and some bushes), it makes a huge difference. People want to be able to sit under their patio and see something appealing. Homes that have just dirt or partially-completed backyards will give the buyer a reason to second guess the home as they see that extra work must be done at their expense. Yards that contain all rock not only make it difficult for a new buyer to add irrigation and foliage, but adds extra heat to an already hot backyard. When homes are initially built, the exterior dirt is leveled for proper drainage. If a yard has not been landscaped for a period of years, the leveling will ruined by wind and rain. Contractors recommend that homeowners maintain a 5 foot perimeter of rock around the perimeter of the house and slightly sloped downward to maximize drainage potential and maintain the termite protection by not having moist areas around the foundation of the house. Pool homes sell as a premium due to the high interest level of Canadians and buyers form the northern states flocking to sunny Arizona to be warm. The majority of these buyers seem to be focused on pool homes because this is a new concept for them. In recent years, pools add about $10,000 to a home’s value, but this year they have added almost the value of a new pool. If a seller is thinking about adding a pool, keep in mind that traditionally they will only recover about $10,000 of the total cost. In our current market, they will recover closer to the full cost. The market can change however, so give it careful thought before spending the money to add a pool if you are not planning on keeping the house for several years. Self cleaning pebbletec pools are the most popular from a buyer’s prospective. Above ground pools will decrease the value of the home. Rule #8: Backyards and side-yards should be landscaped, even if it is simple landscaping. Rule #9 : No above ground pools. Rule #10: The house must be spotless. The cost to correct most of these issues is far less than being forced to sell the house under market value to make up for the lack of buyer appeal. The house must appeal to 80% of the buyer pool in order to sell for market value or above. When we list your house, we hire a professional photographer and provide staging assistance to maximize the quality of the photos. With a reported 85% of buyers on the internet before and during their home search, it is crucial that sellers have a strong internet presence resulting from amazing pictures and description. If you are thinking about selling your home and need some professional advise to prepare for the listing, please contact us so we can visit your home and give you the feedback you need to help maximize your selling potential. 1 ­ We pay for a series of home inspections for you ­ T​he builders hire superintendents for each of their neighborhoods and the end result is only as good as the superintendent. There are minimum construction standards that the builders are held accountable to and usually nothing more. Sloppy construction can be another frustrating issue. Having a qualified third party come in to inspect the house at the framing, drywall and final stages are crucial to keeping the building standards higher and helping you get a more quality­built house. 2 ­ It’s important that you know the maximum amount you should pay for the house.​Not much is free with the builders normally. The visit to the design center can be an expensive one if you decide to upgrade your features and if decide to add on some extras. Your end result could put you in a negative equity situation at closing. It’s important that you view a comparable market analysis before so you can determine a budget. 3 ­ The new home builder purchase contract is lengthy and much of the time, buyers do not really know what they are signing. ​We will be there with you at the contract writing appointment to discuss any question or concerns you may have. 4 ­ We can help you with financing options.​Again the builders expect you to use their affiliated lenders. We can look at the lender fees and loan options with you to make sure you are being charged fairly and that you chose the best program. 5 ­ Lot location and resale features ­​It is crucial that you make the right lot choice for overall investment purposes. The lot location and exposure is critical for resale value and we can offer suggestions for the best location within the subdivision. Having a professional at your side during the selection process for the interior features is also highly recommended. You may pay too much for a feature that has no value later on or miss an important upgrade that is necessary for resale. Buyers must know the in’s and out’s of the process before they make the decision to build a new house. We are happy to provide a free consultation and there is no charge to you to have us represent you. The builder pays all real estate fees. We just have to be with you the first time you visit their office. Please call us to set up a free consultation to discuss your building options 623-536-1111. Here are your real estate statistics for last month. Be sure to call if you have any questions about this report or about how the market is performing. This report includes MLS data for the past 36 months for Maricopa County only as provided by the FlexMLS system. Please note that MLS search results fluctuate as data is added to the system and the figures below were obtained on 2/3/2015. 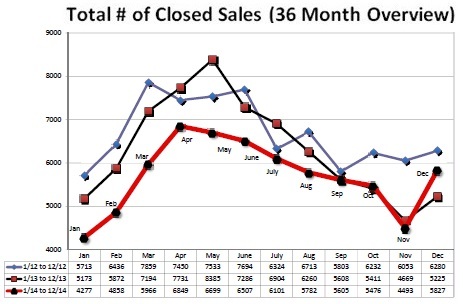 Sellers: The month of JANUARY saw a near 27% DROP in the number of closed sales over the month of December. 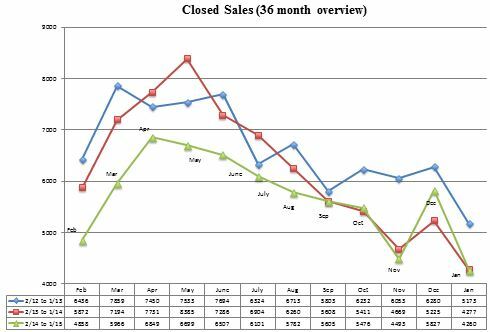 Although we normally see a drop in January, the number of closed sales in January was almost identical to the number of closed sales in January of 2014. Sellers will definitely want to continue to monitor this statistic to see how buyers are engaging in the real estate market in the first quarter of 2015. Buyers: Buyers remained very active at the end of the year ... As is a normal trend, that activity slowed in January. It will be important to see what 2015 brings to buyers in the way of pricing, terms, and inventory. Your real estate professional will always be your best resource for the most current information. Sellers: Last month saw the average sales price decrease from $266,711 to $263,861, a trend that is normal in the month of January. This is the first decrease we have seen since September of 2014. However, this is the second highest average sales price we have seen in the past 36 months. Sellers need to be aware that many buyers continue to request home repairs, buyer concessions, and other credits that will impact the bottom line of a Seller. Watch to see what the first quarter brings as far as inventory and activity. Buyers: This stat is an indicator that buyers paid less, on average, last month. Although this may vary from area to area AND from price range to price range, buyers need to make sure they are fully informed regarding the individual market in which they have an interest. This will give them the best chance of being competitive in the search for a home. Sellers: The month of JANUARY saw the number of homes in pending status seasonally increase from 3,410 homes to 4,432 homes, a 30% increase over the previous month. This is very normal, as buyers re-enter the market after the holiday season. It is very important for sellers to continue to monitor this statistic, as it is a strong indicator of the number of buyers and sellers that were able to come to agreement on the terms of a contract on a home. It will also impact the number of closed sales in the months to come. Buyers: Buyers should review this statistic, as it indicates how many buyers and sellers came to agreement on the sales price and terms of a home sale. Although this may vary from area to area AND from price range to price range, buyers need to make sure they are fully informed regarding the individual market in which they have an interest. This will give them the best chance of being competitive in the search for a home. Buyers should also make sure they are working with a lender who is knowledgeable about the latest lending trends and options. Sellers: The month of JANUARY saw a 4.6% INCREASE in the number of active listings. We have a total of 19,739 residential properties actively listed in Maricopa County as of 2/3/15. With the seasonal increase in new listing inventory, Sellers need to continue to watch this trend as we move through the first quarter of the year. Inventory is still much higher than the 9,785 homes that were available in May of 2012. Buyers: The current market means that buyers had more inventory to consider this past month. Continue to monitor this statistic, as it WILL be the statistic that indicates how many options you will have in your home search and how quickly you will need to act … the higher the number, the more choices a buyer will have. As always, market activity is local and should be researched with your real estate professional to determine the activity and desirability of the homes that are of interest to you. As a reminder, you need to meet with a real estate professional to see how statistics impact the area where you are considering selling or buying. Blended statistics will not be as accurate as a more detailed report that your real estate professional can provide to help you with your decision making. Would you like to know what is happening in your neighborhood? Do you need help deciding whether to sell or not or would you like to know if now is the right time to buy? I would be very happy to get you that information. When combined, those three indicators point to an extremely strong real estate market. Potential home buyers should move fast if they want to spend less. Buyers should act now––delayed purchases will only result in higher monthly mortgage payments as prices and rates rise. So, buyers beware: The clock on these low mortgage rates may be ticking. From a macro level, the economy and the housing market are in far better shape now than a year ago. We are creating jobs at a pace now that we haven’t seen in 15 years. Friday’s initial report on fourth-quarter GDP came in at 2.6% growth. Underneath the number was mounting evidence that consumer spending is indeed strong and wage growth is finally accelerating. Low prices at U.S. gas pumps have turbo-charged consumer confidence and are enabling households to spend more and save more for big purchases like buying a home. Besides global factors that bode well for buyers, the U.S. housing market is also in much healthier shape. Foreclosure inventories have fallen to nearly normal levels everywhere except for a few slow markets. As a result, distressed sales are no longer weighing on the market. We’re back to a normal and upward trajectory for housing prices, and there’s little risk of prices declining because the inventory level has declined in the Phoenix market over the past few months. This is the lowest number we have seen since September of 2013We are more worried about listings and new home construction not keeping up with the demand. The market is primed for first time buyers and sellers. 2015 is the year of the millennial when it comes to real estate. Millennials are at a critical demographic tipping point where their sheer numbers will naturally drive demand for more home sales. Most first-time buyers move into their first home when they’re between the ages of 25 to 34. Sellers should also be encouraged—especially if they’re sitting in affordable homes waiting for a long-overdue upgrade. With recent clarification of mortgage standards, new low-down-payment programs, and lower FHA insurance premiums, access to credit should improve. That means those folks who’ve been sitting on equity in entry-level homes can finally upgrade to bigger homes and retirement homes. There are some risks to keep in mind. Supply must keep pace with demand, otherwise affordability declines more rapidly and would-be buyers can’t find the home of their dreams. The U.S. economy could hiccup from global weakness. Consumers could take the money they’re saving on gas and spend their money on items other than new homes. The probability of those risks completely reversing the recovery is slight, but it is strong enough to limit the potential. On the flip side, if the economy ends up growing more than expected and first-time buyers come roaring back, we could end up in an even stronger market. Here’s to a robust and strong 2015! Here are your real estate statistics for last month. Be sure to call if you have any questions about this report or about how the market is performing. This report includes MLS data for the past 36 months for Maricopa County only as provided by the FlexMLS system. Please note that MLS search results fluctuate as data is added to the system and the figures below were obtained on 1/3/2015. 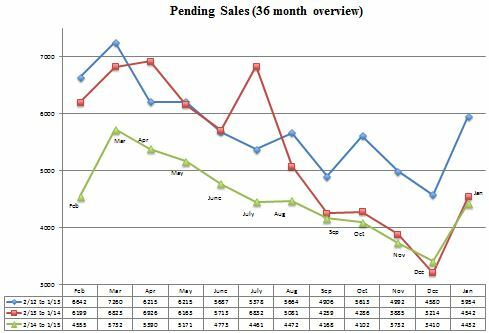 Sellers: As is normal for the month of DECEMBER, our market showed a significant increase of 29.7% in closed sales between November and December as buyers wanted to finalize the sales process prior to the end of the year. 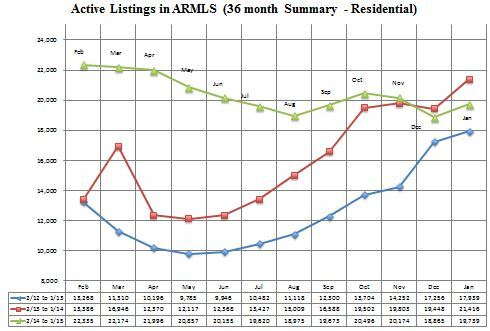 Last month’s numbers showed that we had 5,827 residential properties sell in Maricopa County compared to 4,493 in the month of November. This number is 11.5% higher than December of 2013 and 7.2% lower than December of 2012. Buyers: Buyers remained very active at the end of the year. It will be important to see what 2015 brings to buyers in the way of pricing, terms, and inventory. Your real estate professional will always be your best resource for the most current information. 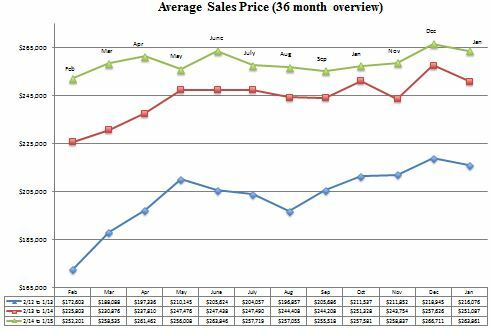 Sellers: Last month saw the average sales price increase from $258,837 to $266,711, a trend that is normal in the month of December. 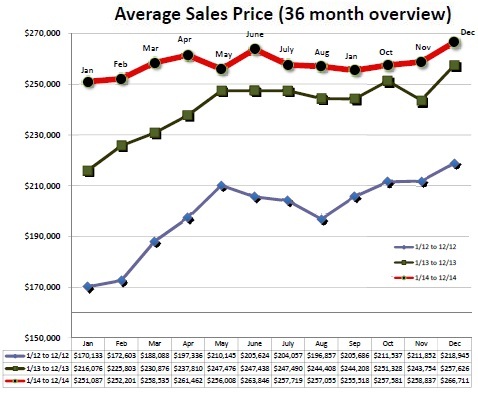 This is the third month in a row we have seen the average sales price increase. This is the highest average sales price we have seen in the past 36 months. However, Sellers need to be aware that many buyers are now requesting home repairs, buyer concessions, and other credits that will impact the bottom line of a Seller. The first quarter of each year normally brings a large influx of inventory that will bring more competition for buyers which may have an impact on pricing, time on market, and terms. Buyers: This stat is an indicator that buyers paid more, on average, last month. Although this may vary from area to area AND from price range to price range, buyers need to make sure they are fully informed regarding the individual market in which they have an interest. This will give them the best chance of being competitive in the search for a home. 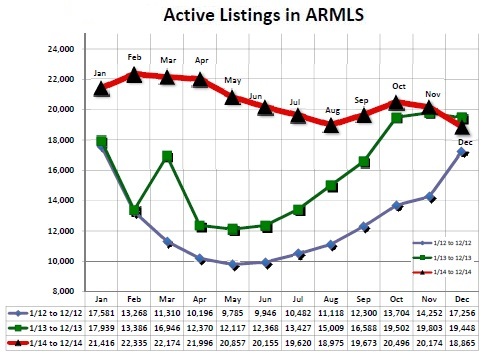 Sellers: There was a 6.5% decrease in the number of active listings from November to December. We have a total of 18,865 residential properties actively listed in Maricopa County as of 1/3/15. This is the lowest number we have seen since September of 2013. Sellers need to continue to watch this trend as we move into a brand new year AND into a month where many sellers decide to list their home for the first time, potentially creating “new” distractions for potential buyers. Buyers: The current market means that buyers had fewer new homes to consider this past month. Continue to monitor this statistic, as it WILL be the statistic that indicates how any options you will have in your home search and how quickly you will need to act … the higher the number, the more choices a buyer will have. As always, market activity is local and should be researched with your real estate professional to determine the activity and desirability of the homes that are of interest to you. 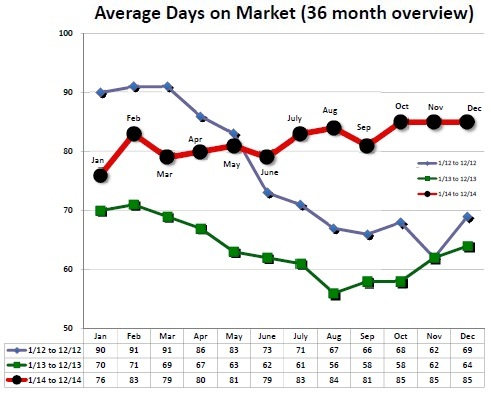 Sellers: Last month s aw the average days on market once again remain steady at 85 days. A little over one year ago, we were at 56 days. The longer a home is on the market, the more costly it is to sellers, as they continue to pay mortgage payments and all the other fees associated with home ownership. Days on market are controlled by appeal to buyers – in condition and in price. Staging and realistic pricing can dramatically impact a seller’s success in today’s market. Buyers: This statistic shows that buyers are still remaining active in today’s market BUT they are taking longer than in the past to make decisions because of the increase in inventory. Buyers need to remain aware that the great homes will always draw lots of attention regardless of the real estate market we are experiencing. We would be very happy to get you that information for you! Zero Down and Low Down Payments Available Now! Zero Down and Low Down Programs Available NOW! What if your rent payment is more than what you could pay for a mortgage payment? In rural areas like Buckeye (including Verrado), Waddell and some areas of Surprise, you could apply for USDA 100% Financing. USDA has an informative website where you can type in the property address and see if it qualifies: eligibility.sc.egov.usda.gov. You have to have a 640 credit score and income limits are based on the household size. The Home in 5 Down Payment Assistance program gives you 5% of the loan amount gifted by the State to use towards your down payment and closing costs. This type of loan is FHA. The HFA Down Payment Assistance program offers 4% of the loan amount gifted by the State to use towards your down payment and closing costs. This is a conventional loan. Your credit score must be at least 680. If your credit score is 640-679, you can put down 5%. Since the grant only covers about 3% down, you would have to have some money saved up to pay the difference. The household income limit is $88,340/year and the home price cannot be over $353,360. You must also take a buyer education class before closing escrow. The Homes for Heroes program is offered by Jennifer Gokool at Castle and Cooke Mortgage. She personally offers a credit toward your closing costs of 1% of the purchase price up to $1000 for police, fire, military, medical and education staff. This credit is offered as a “thank you” to recognize the service to our community. VA Financing - This program is for Veterans only and offers zero down. The program also does not require mortgage insurance so it’s a great program to take advantage of if you are a veteran. If you do not quality for the programs above, the next best option for a low down payment loan would be standard FHA financing. The minimum down payment is 3.5% of the purchase price. You can actually have a 580 credit score and still qualify! If this is the case, you must have 4 months of reserves saved in your bank account and no one can give you a “gift” towards that savings account. You must also have been at your current job for at least 6 months or same line of work for 12 months without any lapse in employment. Finally the lowest down conventional loan for those of you whose household income is more than $88,340/year is the standard 5% minimum down payment program. Your credit score needs to be at least 620. With any of these no-down or low-down programs, you could ask the seller to pay 3% towards your closing costs. This is possible in our current real estate market due to the higher inventory levels and lower amount of buyers in the market. Our trusted lending partner, Jennifer Gokool at Castle and Cooke Mortgage offers all the above programs as well as many others. Her team’s focus is honesty, integrity, and open communication with every client. Buying a home is a major decision and they know technology should help the process, not remove the human interaction completely. Her team will be there to help in-person rather than only through email, on-line or over the phone. To ensure their loans are ultra-precise, they handle the entire loan process and have a dedicated team to handle every part of the loan. They can also close a loan in 2-3 weeks if necessary. Please call us to discuss your options! We will help you find the best program for your needs. Now is a good time to buy because there are less buyers in the market during the Holiday season and therefore less competition when making an offer. We look forward to hearing from you! This Veteran's Day, we honor those who have so bravely served this country and those local heroes who support our communities. VETERANS - now is the perfect time to sell or buy and you will obtain a bonus of $1,000 from us! ** Offer good through January 31, 2015. Buying and selling real estate is something that only happens a few times in one’s life and should be handled with utmost professionalism and exceptional customer service. The Baxter Team has one goal—to build relationships and to make clients for life. They plan to play an integral role in the West Valley and to make a difference in the lives those who reside in this fabulous community.